Rotating, Scaling and Translating of individual rings. Rotates the object in X, Y or Z. It's slightly different from the Bend functions in the Stonetool, since here I keep track of the top and bottom of archcube, so they get rotated the same time. Since Sculptypaint v.091 you can rotate individual rings, and that gives much better rotation control. 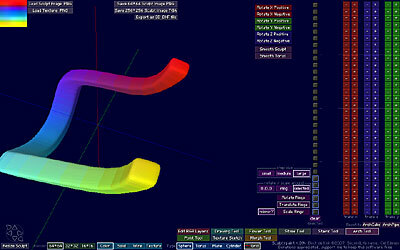 In sculptypaint v.091 I added some new functions in the Archtool. Rotate, Translate and Scale Rings. You can select a number of rings the same time pressing and releasing your mousebutton, just like the point and morph-lock tool. With some pictures I will try to explain the different functions. I start with an Archcube, that will be modified. ** Currently Scultpypaint v.092 is only available to people that joined the sculptypaint group in secondlife. For example; with mirror top to bottom, I look at the coordinates of rings 0 to 31 and mirror these points on the Y-axis for rings 32-63. You can translate the whole model for different results.